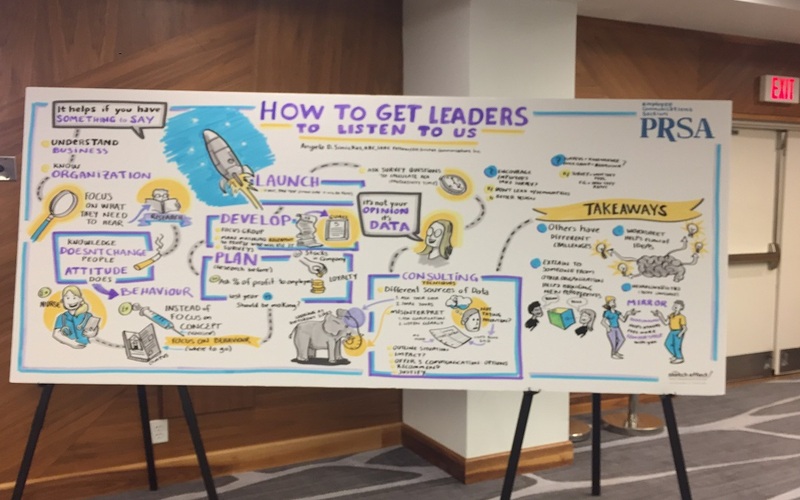 The Public Relations Society of America (PRSA) Employee Communications Section conference, CONNECT, had a sellout crowd this year. Held in mid-May in Nashville, 2018 PRSA CONNECT brought together internal communications professionals from across the country as well as some internationally. I was able to reconnect with old friends and make some new ones. As internal communicators, we have a fantastic opportunity to exercise put our strategic skills to work and offer communication platforms that better connect with employees. From turning the town hall session into a real opportunity for dialogue to reinventing our onboarding process, we can do just that. Following are a few key themes or “aha” moments from the conference. Based on the nature of some the presentations as well as conversations with attendees, many internal and corporate communicators are still having a tough time getting their leadership to lead through effective communications. Want to know the biggest reason for the lack of focus? Time. No surprise there. One conference presentation that caught my attention was from Johnson & Johnson (J&J). And for a specific reason. So often, we work with companies that do not require their leaders to improve their communications. Not so with J&J. The company evaluates its leaders two ways. The first 50 percent is based on their business results. And the other 50 is based on how they get their work done. The “work done” part is all about their people. How they’re treated, communicated with, and more. We’re big fans of that! We need to give our leaders effective and relevant communication tools to dialogue with employees. The best way to do that is to know your audience. One way is to segment employees according to communication preference. And then use different tools to reach them. Don’t forget to track the readership or viewership to arm yourself with compelling evidence to share with leadership. Leaders need to know when employees are paying attention and changing behaviors as a result! Another take-away from the Johnson & Johnson presentation was that how people consume entertainment at home helps inform how they’ll use digital technology at home. Makes sense! This is a good way for leadership to assess what digital tools to use with employees. Another great comment during this same presentation related to internal social networks. The presenter noted it’s important to remember that social networks are powerful tools that enable self-expression. But companies need to make sure leaders respond to any divisions expressed on social media without divisiveness. Simple statement, but sometimes hard to do. Remember, though, that empathy can help drive engagement. Getting back to the issue of leaders’ lack of time to devote to communications: Less is sometimes more. For example, gone are the days of slick corporate videos, which took up a lot of time and budget. Instead, younger generations value authentic communications. That means leaders will stumble over words in a live video. And that’s ok. Showing the raw, human side is refreshing for many employees. Slick personas are not. So remember, less is sometimes more. Use this as a persuasion point with leadership. As we’ve discussed in more than one of our past blogposts, internal communications can play a vital role in improving workforce engagement. According to Gallup, 87 percent of employees aren’t engaged. And only 13 percent are excited about the work they do. Internal communicators can help close these gaps! Also of interest is that employees are lonely. Forty percent of Americans feel lonely, which is twice as much as in 1980. Among the loneliest professionals are engineers and research scientists. The internal communications function is in the best position to help connect the employer and community to these disconnected employees. We’ve devoted an entire blogpost to the topic of tapping the power of internal communications (IC) to manage business risks. An IC professional from a leading pharma company shared ideas on how to build awareness of and behaviors around protecting company and customer data. Companies are under increasing threat of data breaches from both malicious insiders/employees or simple employee negligence. And according to a 2017 survey by Towers Watson on cyber-risk, employees have an insufficient understanding of how to protect company and customer data. Companies can improve by educating employees around data breach prevention as well as how to report suspected breaches when they occur. Both are important. Another presenter discussed the challenges companies face with employee recruitment and retention. Human Resources can and should partner with IC to develop and implement recruitment strategies. As we discussed in a recent blogpost on employee onboarding, research shows the average cost of replacing an employee is between 16-20 percent of that employee’s salary. And the organizational costs are a whopping 100-300 percent of that person’s salary. IC can help companies and organizations save significant costs! Context: Is the situation a merger or an acquisition? The answer helps shape your culture and communication strategies (below). Culture: Do you integrate cultures or retain one? Find the commonalities between the two cultures. Focus on communicating the aspects of culture and the organization that will stay. Communication: How do you balance transparency versus timeliness? Provide the right amount of detail when employees need it—not more and not less. Identify stories to share from both organizations. Conference content once again reinforced what research has already proven: People most often leave a company because of poor management/supervision, not the job itself. A negative workplace culture is also a larger contributor. Again, internal communicators can help shape workplace culture through transparent communications. PRSA CONNECT was a memorable conference. It was great to be among like-minded professionals. People who are passionate about internal communications and how IC can improve the bottom lines of organizations. If you’re interested in checking out the PRSA Employee Communications, visit here. And don’t miss out on CONNECT19, which will be held in Phoenix next spring.